What to do with Black Currants? In Britain, they just tend to end up as Ribena. France created an altogether better solution – Creme de Cassis. France took its Black Currants from England and Holland centuries ago. Their best come from Burgundy, called “Noir de Bourgogne”. The woods and hills above the vines are full of them. Formerly, Black Currants were popular in treating various ailments, from sore throats to gout. They certainly contain significant amounts of Vitamin C and anti-oxidants. Then in 1841 a liqueur maker and distiller from Dijon produced the first Creme de Cassis liqueur. He had noticed how Parisian Bars made their rough wine more palatable by adding fruit. Consequently, in France, most Cassis is widely used in this way to create Kir. It’s an apéritif that makes delicious summer drinking, ranking alongside Pastis in popularity. It’s also an ingredient used in many a nouvelle cuisine dish. Kir was originally just known as blanc-cassis. At the end of the second World War, it was made famous by Chanoine Felix Kir, the Mayor of Dijon and an ex-resistance leader. He served it to the likes of De Gaulle and Khrushchev, and afterwards, the drink was renamed Kir in his honour. A few drops (say 10ml) of Cassis adds interest and vitality to an otherwise dull glass of white wine. Traditionally, Burgundy’s Aligoté is preferred, but virtually any supermarket plonk will do. There’s also the upmarket Kir Royale, which uses sparkling white wine to create a fizzy version (again, do use cheap fizz rather than Krug). Boring wine? Reach for the Cassis! You could just go and buy Vedrenne Super Cassis from the likes of Waitrose. Made from Burgundian Black Currants, the world’s best Creme de Cassis is around £8.99 per 50cl bottle. Vedrenne is fantastic quality, but as the constituents are only Black Currants, sugar and alcohol, why not make your own? 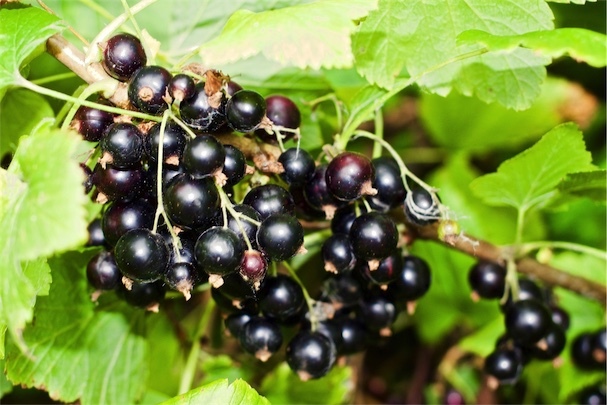 Black Currant bushes produce abundant fruit every July. Making Cassis is so easy even I can do it, just allow sufficient time: a couple of hours spread over 2-3 days. My Cassis recipe is like the one in the excellent Jane Grigson’s Fruit Book, where she states it came from her Burgundian Great Aunt. It’s been well road-tested down the years. Just keep these ratios according to how much fruit you have. Use the freshest Black Currants you can. Wash and rinse. De-stemming is optional. First, soak the Black Currants in the red wine in a bowl for 48 hours. Then feed this mixture into a liquidiser. Tip all the resultant mush into a large bowl lined with doubled-up muslin. Now pull the muslin together and twist it, so the liquid is squeezed out into the bowl. You’ll need a little strength to press it through the muslin, but be gentle as too much force will extract too much pectin, which will make the final Cassis too gloopy. If necessary, sieve the liquid to remove any pips and stems. Measure the liquid and put it into a preserving pan. A pressure cooker base is a good alternative, but ensure whatever pan you use doesn’t react with fruit acids. To each litre of liquid add 1kg of sugar. Stand over a low to medium heat and stir – the sugar will dissolve quickly. Slowly bring up the heat so that the liquid is around 80° C, plus or minus 5°. You need to keep that temperature constant over the next two hours. On no account let it boil! 2nd hr: check the temperature and stir thoroughly every thirty minutes. After two hours the liquid level with have reduced slightly, and it will now be slightly syrupy. Leave to cool, overnight is easiest. When cool, you can add the vodka. In a bowl, add 1 part vodka to 3 parts Black Currant liquid. The easy way is to measure how much total liquid you have and divide the number by three to give the amount of vodka you need. The result will be around 15% abv in strength. Now it’s time to bottle it. Ex-wine bottles with screw caps are ideal. This Cassis will keep well, a year or two easily. You can drink it after only two days, but the longer you leave it, the better it becomes. Add small quantities of Cassis to hearty winter stews, (yes, really!) or use as a base for a sauce with meats such as Duck. Meanwhile, can you guess what I’m doing this week? Very timely Paul, as we have just run out of our French stock! Let’s hope I can pick blackcurrants before the birds get them. Soon time to get the netting out! You’re about 2 weeks ahead of me, c’est terroir! Beat the birds to the currants this year – just finished bottling 2.5 litres. Thanks for the recipe Paul – now looking forward to tasting my first homemade Kir Royale! Thanks for reading and using it, Julie. Do let me know how it turns out! Just waiting for mine to cool, then adding vodka tomorrow. It smells delicious so far!!! Have just started my first batch. Was it not named after a canon? Hi Eithne, Kir was named after The Mayor of Dijon, Chanoine Kir. Chanoine in French means Canon in English, a religious term. What happens if you let it boil? You risk getting a sticky jammy mess. The alcohol will also boil off and the sugar may even caramelise. In short, you won’t get good Cassis. Just made this with this year’s allotment harvest; its fabulous! I am going to plant a couple more bushes I think. Left my black currants a little longer than usual to ripen (we have so many that the birds can’t cope!) Have made 5 litres and it tastes delicious already , thanks Paul! I have loads of black currants from the last 2 years harvest which are frozen. Do you think I could use this recipe with frozen blackcurrants once thawed?